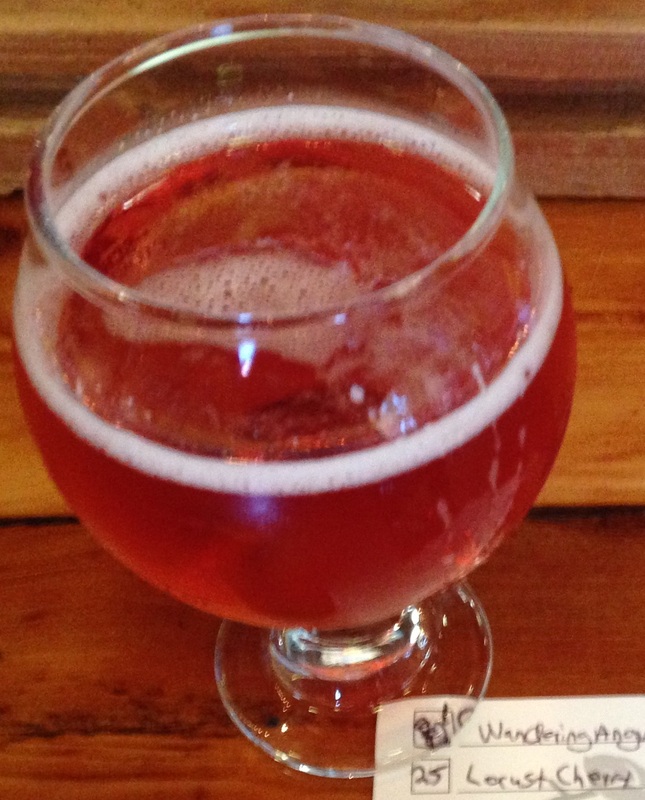 This is Part 2 of a trip report on the Schilling Cider House, covering the 18 ciders I tasted (of the 32 on tap). Pretty impressive, right? See Part 1 here, which covered the Cider House itself. I tried to take a photo of each cider, but some of them didn’t turn out, so I’ve only included photos of some of the ciders with interesting hues. Thankfully though, I took notes! I had two flights of six ciders (3oz) each, and six tastes from our bartender. This is one of their most popular ciders, and is available bottled (22oz) in the winter. It smelled of cinnamon and definitely had a Chai tea-like taste. Definitely not my thing, but it was my husband’s favorite taste of the day. This is the same cider as above except on Nitro, which added some additional smoothness. It was quite foamy from the tap from the nitrogenation, and needed a couple minutes to calm down. I’m not a ginger fan, but this was handed to me, so I tried it! It had a much milder initial ginger taste than smell, but had more of a ginger aftertaste. I think Ginger fans would really like this one. Its not too overwhelming with Ginger. Hopped ciders aren’t my thing, but my husband wanted this, and thought it was pretty decent. I had one sip and it is definitely hoppy, but way less than Reverend Nat’s Envy / Hopland #5. Otherwise I can’t really comment on it. This cider seemed intriguing, I like Sriracha & Lime, and there was some chatter online of folks liking it, so why not? It definitely smelled of Sriracha & Lime, but all I picked up in the taste was the Sriracha (no Lime). Definitely spicy! I don’t think I like spicy ciders. I can tolerate spicy food, but the spiciness seemed to overwhelm the cider here. I think this would have been better to do with a sweet citrus/lime cider with only a hint of Sriracha. I tried this on a whim as it sounded unique/odd. I picked up a citrus scent and it had a lovely pink color, similar to grapefruit juice. It was definitely dry, and very very tart! I unfortunately couldn’t take more than two sips of this one. Pretty rosé color. Smelled like cherries. However, I barely picked up any cherry flavor when tasting it. Folks who like drier ciders but want a fruity cider may like this, as many fruit infused ciders tend to be sweeter. Another cider handed to me from the bartender, who was trying it for the first time as they just tapped it. It didn’t smell spicy, but it was! The bite hit my sinuses about 10 seconds after drinking it. Again, the spice was overwhelming. I wasn’t a fan, but my husband didn’t mind it. Very dark & vibrant hue. Extra smooth taste (from the nitrogenation). I’ve tried their Black Currant flavor, and I honestly couldn’t pick up the added Lavender in this one. However, my husband did. In addition to the black current, I picked up some cherry notes. This was much better than the bottled Black Currant I had of their’s (which was also quite good). I imagine tap + Nitro did it. Excellent! The bartender said this was very similar to Schilling’s Oak Aged (which was surprisingly absent from the tap list). I’m a huge fan of barrel aged ciders, so I was anxious to try it. This is a milder barrel aged cider, and quite tasty. I think I give the slight edge to Schilling’s Oak Aged though. And, overall, my favorite barrel aged ciders so far are Woodchuck Winter Chill (which also has some vanilla flavor) and Thistly Cross Whisky Cask (very smooth), both of which are significantly sweeter than Schilling’s & Finnriver’s oak aged selections, but I do enjoy Schilling Oak Aged. Yum! 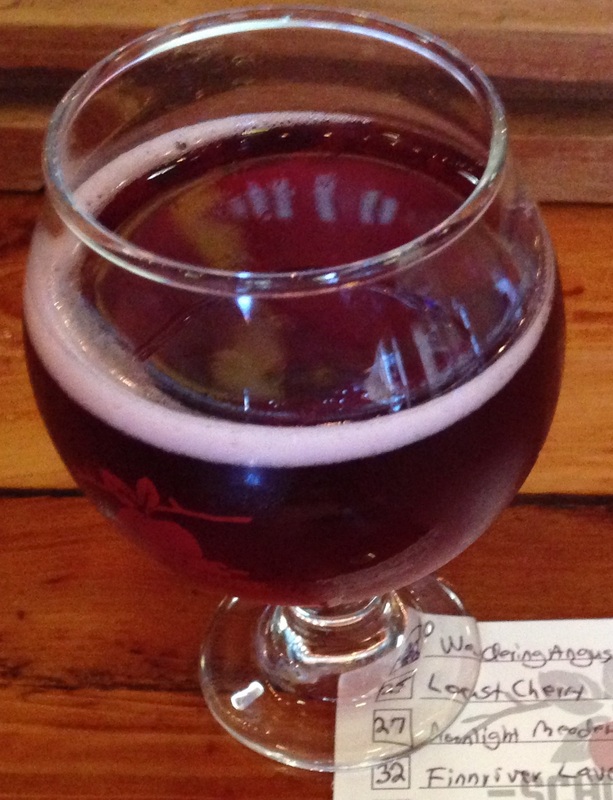 For a cherry cider, I was expecting more flavor, but it was quite mild, and there was little cherry scent or flavor. This has a sweeter start and more tart finish. This was pretty similar to the Elemental Cherry (which also had a mild cherry flavor), except a bit sweeter. 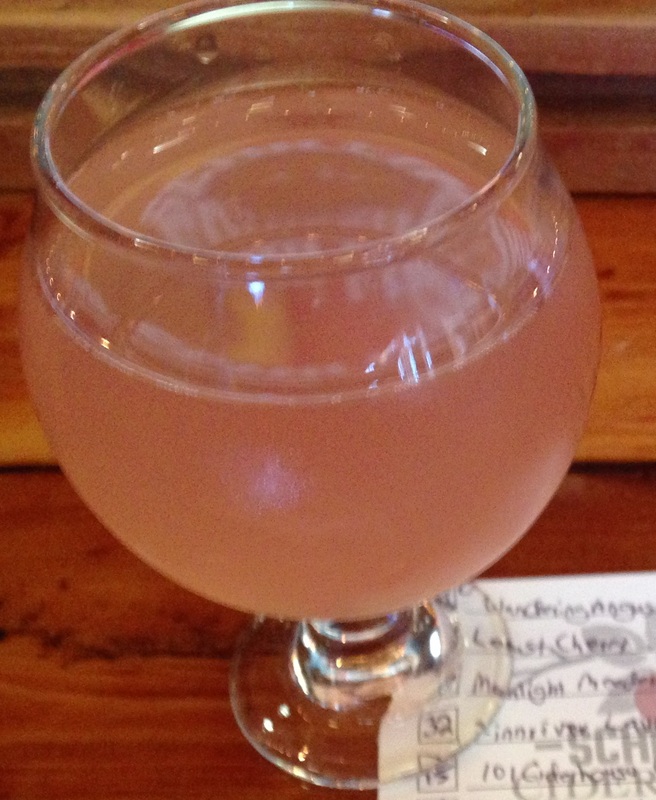 Hard cider blended with honey & brown sugar, fermented, then barrel aged (draft only release). Honey smell (duh). Quite sweet. Very smooth. Tastes like it would be a higher ABV than it is (but I wouldn’t call the taste boozy). I wouldn’t have guessed it was barrel aged. Awesome! I was excited to try this one. The passion fruit smell was amazing! However, the passion fruit taste was quite mild, and it had a bit of a tart & bitter finish, which I wasn’t expecting. It is however a refreshing and easy-drinking cider. This was a very mild Perry; I could barely pick up any pear flavor. It was however pretty tasty and smooth. One of Rev Nat’s regular release ciders. This was a mild & crisp cider which I found to have a fairly bitter finish. Pretty boring for my tastes. A refreshing & smooth Spanish cider. I can’t really put the flavor into words, but it is one of those ciders which has a flavor profile which seems sweeter than it really is. It was Schilling’s most expensive offering by the way, at $11/pint, but only $2 for a 3oz taste. This makes me want to try more Spanish ciders! Fairly plain, and I found it tart & bitter. 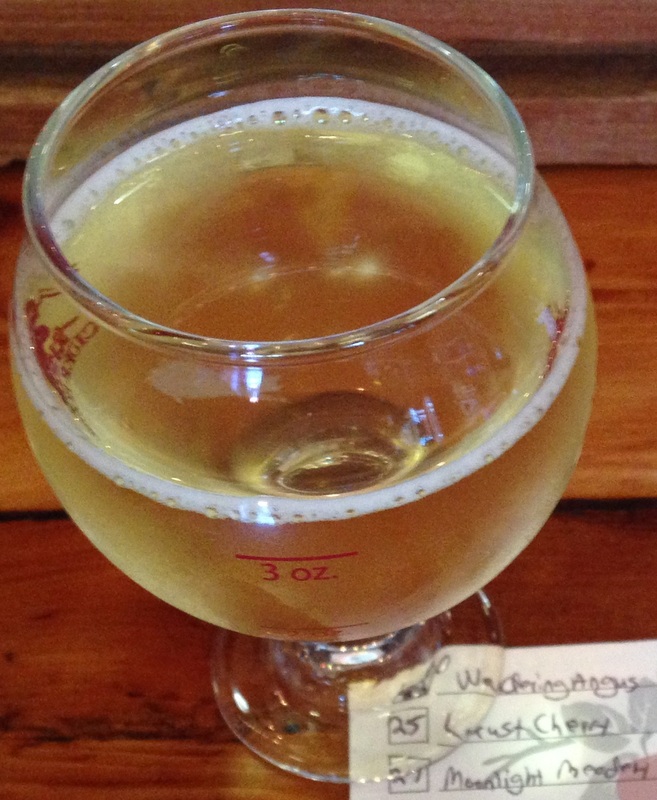 Taste profile was in-line with the two Wandering Aengus and two Anthem (also made by them) ciders I’ve tried. Also fairly boring for my tastes. This is a mild & refreshing cider with a hint of ginger. The bartender said he picks up almost a salty flavor, which after hearing that, I agreed somewhat. My favorites from this tasting were the Moonlight Meadery “How do you Like them Little Apples?”, Finnriver Oak & Apple, Finnriver Lavender Black Currant, and Viuda de Angelon Sidra Brut. Quite an interesting combination, right? I also learned that in addition to hopped, ginger, and overly dry ciders, I definitely don’t like spicy ciders! 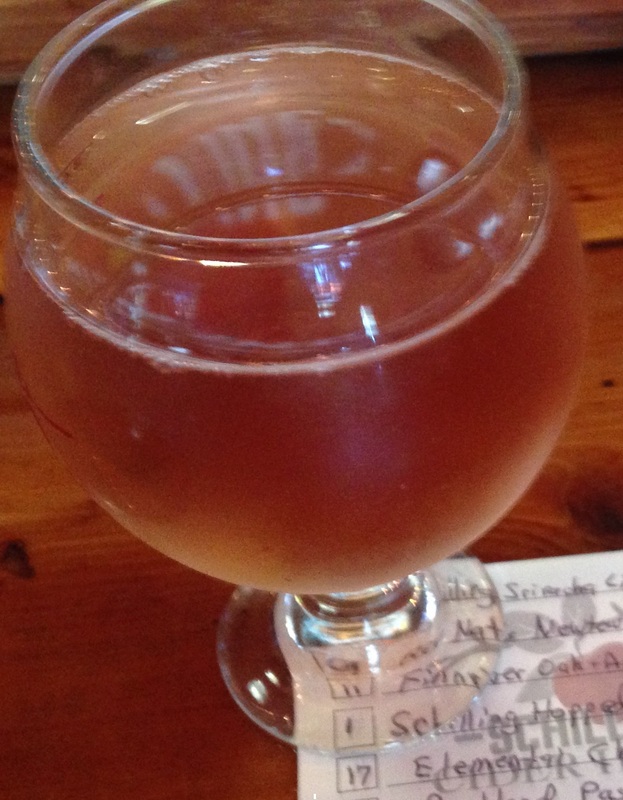 I look forward to returning to the Schilling Cider House to try more ciders, as their selections change all the time. Stay tuned for reviews of the five ciders I picked up from their bottle shop (shown in Part 1).